Your favorite peel just got stronger!! Alpha Beta Daily Face Peel on pre-soaked cotton towelettes. Higher concentrations of Alpha Beta Acids plus newly added anti-aging boosters, including Mandelic Acid and Willow Bark Extract, deliver a stronger peel without risk of irritation or recovery time. 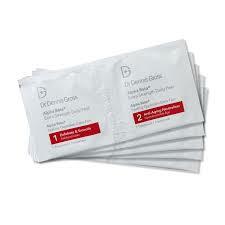 Extra Strength Alpha Beta Peel diminishes lines, wrinkles, pore size and helps to treat breakouts. This extra strength version is best suited for stubborn skin conditions that have not responded favorably to other anti-aging treatments. This anti aging product not only diminishes the appearance of wrinkles, but helps complexion problems, balances oil, tones skin, and increases clarity and radiance. Plus, it proves a daily, gentle approach can give superior results vs. a harsh approach. Like exercising daily is better than a long workout once a week, its better to treat your skin daily. The revolutionary product that made Dr. Dennis Gross famous, this two step, at home peel in ready to use pads delivers both immediate results and long term benefits. The patented system provides a precise blend of Alpha and Beta Hydroxy Acids to improve skin tone, texture, and clarity, plus moisturizers, Green Tea Extract, and antioxidant Vitamins A, C, and E to leave skin soothed, balanced, protected. Apply to clean, dry skin. Swipe Step 1 pad over face, from forehead downward to neck in semi circular strokes. Avoid contact with eyes and lips. Continue to apply evenly until pad feels dry. Wait 2 minutes. Follow with Step 2. The key to professional results. Swipe Step 2 pad over the face with the same technique as Step 1. Apply until pad feels dry. Do not rinse or use products containing alcohol. Allow skin to dry. Apply moisturizer. For all ages and skin types. Effective in all seasons and climates.